A document describing the benefits and limitations of patient rostering in family practice. Includes advice for family physicians who have implemented rostering or are considering it. 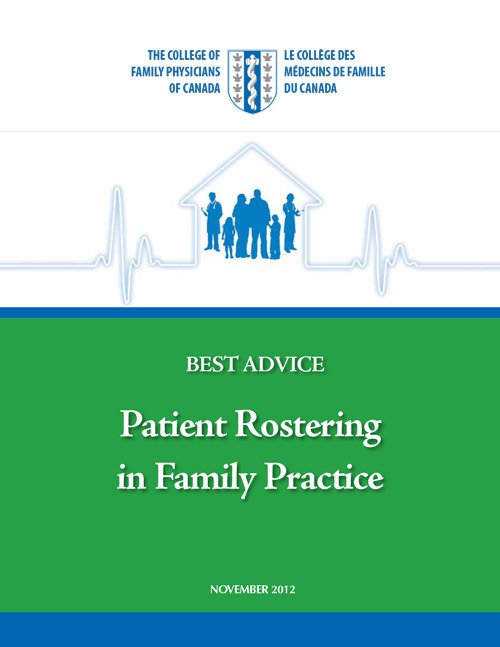 The PMH Best Advice Guide on Rostering is a tool that provides information to Canadian family physicians who have already implemented or are considering patient rostering in their practices. Rostering is when patients register with a family practice, family physician, or team. The paper highlights the benefits and limitations of patient rostering and provides information to help physicians implement rostering in family practice. Rostering facilitates accountability by defining the population for which the primary care organization or provider is responsible and facilitates the ongoing relationship between the patient and provider. Rostering has been recognized as an important feature of a high-performing primary health care system and can be formally or informally agreed upon. While there are limitations to rostering, such as the requirement to have a minimum number of patients in the practice to qualify for rostering, the benefits for physicians, their teams, and their patients outnumber these limitations. These benefits range from providing the practice with information on patients that can improve care; facilitating patient access to care; and ensuring that complete patient information is available when referring to other specialists.